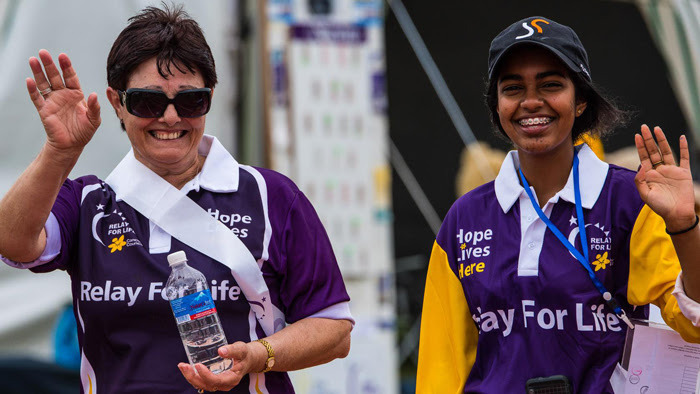 The SBA is proud to support the Australian Cancer Council Relay for Life! With cancer touching most of us either direcly or through a loved-one, the SBA is proud to support the Cancer Council as they invest into the research of cures for the many types of cancer that impact our families and community. Purple is the colour of Cancer Councils Relay for Life and represents an overnight experience to honour Survivors and Carers remember loved ones and fight back together against Cancer. We are asking the businesses of Sunbury to help make the community aware of our event by decorating your business with balloons, streamers and posters to use during the week of September 5th till 11th. The Cancer Council will provide participating businesses with a Promotions Kit which will include everything you need to decorate your store. Some other creative ideas ………clothing stores could dress mannequins in purple, bakeries could sell cupcakes frosted in purple and florists sell bunches of purple flowers ….. Walk, skip or run for as long or far as you like, and tag a relay team member when you need a break. Go at your own pace and support cancer research within your own fitness level!